Our 2012 body armour is called the Hornet. Designed to provide protection that exceeds the up-to-date IMAS requirements, the Hornet is comfortable to wear while squatting, kneeling or walking. The weight is carried on the wearer’s hips, and the front of the thighs are protected by flaps with the SD (design registered) shaped polycarbonate inserts. 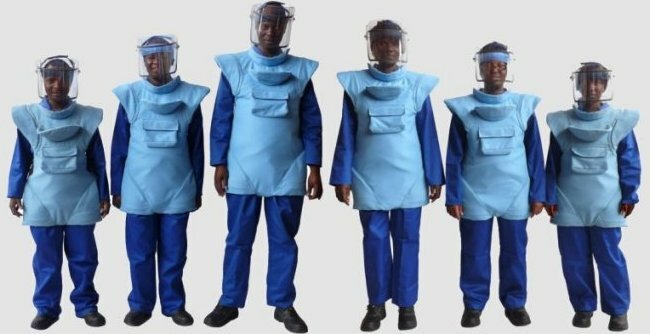 The armour is available in Large, Medium and Small sizes. range, so providing secure face protection while avoiding restricting downward vision. Broad webbing straps and quality buckles make the hornet comfortable and easy to wear. With a multi-layer Kevlar/polyamide inner covered by a washable Cordura® textured nylon outer that is exceptionally longlasting and resistant to tears and abrasions, the SD medium sized Hornet armour weighs less than 2.9kg. Colours may vary between dye lots. Your logo, radio-clip straps of other refinements can be added. Contact us to discuss your needs. 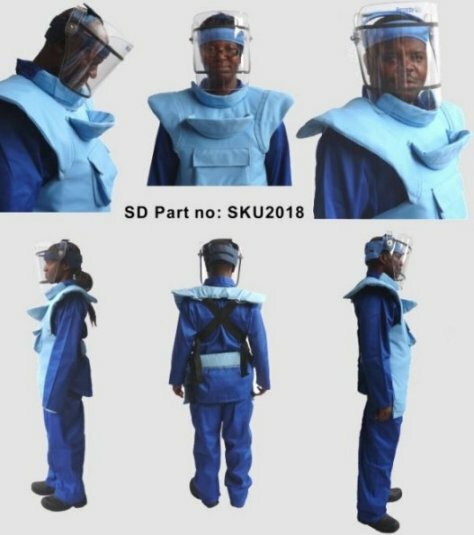 See Aprons for an explanation of why frontal apron protection has become the standard in Humanitarian Demining.